Rural and unspoiled, the northern region of Portugal has some of the country’s best cultural sightseeing. A sweeping stretch of beaches dotted by fishing towns, the spectacular Rio Douro with its vineyard-covered hillsides, and the remote towns and villages of the Trás-os-Montes (Beyond the Mountains) offers an opportunity to discover a centuries-old way of life that is rapidly disappearing. Throughout the year you’ll find festivals and romerias—pilgrimages in honor of the saints, and open-air country markets. The food is hearty and delicious, the vinho verde (semi-sparkling young wine) a delight. Porto Porto is Portugal’s 2nd largest city and its medieval center a UNESCO World Heritage Site. Soak up the atmosphere, starting with the lively Ribeira riverfront district. Up steep streets, the massive Sé (cathedral) began life as a 12th-century Romanesque monument and ended up with 17th-century Gothic overlays. For a spectacular display of azulejos, visit the Estação de São Bento, where 20,000 distinctive tiles illustrate Portuguese life and famous battles. Art aficionados will appreciate the Museu Nacional Soares dos Reis, which is housed in a former palace of the royal family and contains Portuguese primitive works and fine and decorative art. Vila Nova de Gaia is a town across the Rio Douro that has been the headquarters of the port-wine trade for over 200 years. Here the wine is transported and matured before export. Many port-wine lodges are open for tastings and tours. The Douro Valley From its source in Spain, the Douro River spectacularly slices through granite rock as it courses to the sea. As this is Portugal’s premiere wine district, hillsides are terraced with vineyards, with pockets of fruit orchards, almond and olive trees in between. An outstanding stretch is the road between Sabrosa and Pinhão. Casa de Mateus Who doesn’t remember a few hazy nights drinking Mateus wine in a college apartment and using the distinctive bottle as a candle holder? Outside Vila Real, the 18th-century, Italian-designed, baroque manor house on the estate where the rosé is produced literally bursts with art treasures. The surrounding gardens are lovely, and the manor is home to the 7th count of Vila Real. 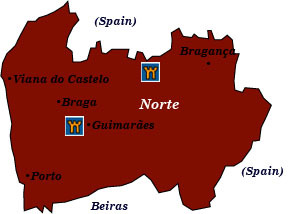 Guimarães In the 12th century, Afonso Henriques chased out the Moors and established himself in the 10th-century castle above the town, thereby establishing the country of Portugal. Guimarães’s historical center is now a UNESCO World Heritage Site. The well-preserved castle and the 10th-century Igreha de Nossa Senhora da Oliveira (Church of Our Lady of the Olive Branch) are the town’s best sights. Citânia de Briteiros Celtic hill settlements known as citânias are scattered throughout the north of Portugal. Thought to be the last holdout against the Romans, this particular archaeological site consists of tiered defensive walls surrounding 150 stone buildings. Parque Nacional da Peneda-Gerês An extraordinary array of flora and fauna may be found in Portugal’s only national park. Brilliant colors adorn the hillsides, as a result of receiving the country’s greatest amount of rainfall. The park’s most important site is the sanctuary of Nossa Senhora da Peneda, a famous pilgrimage destination. There is even a 13th-century castle open for exploration at Lindoso. Villages inside the park still carry out traditions as they have for centuries—for real. Bragança A 12th-century fortress dominates this aristocratic town that is rich in medieval atmosphere. The Museu do Abade de Baçal is filled with exhibits of archaeology, ethnography, and art, and is considered one of Portugal’s best regional museums. Bragança also makes a great base for excursions to the Parque Natural de Montesinho, where you may see tiny, traditional villages filled with character. Braga Braga was once Portugal’s religious capital, with Christian roots dating back to the 6th century when it became a bishopric under the Visigoths. 35 churches mark the city today, and its Sé or cathedral is Portugal’s oldest. Just east of the city is the important pilgrimage shrine of Bom Jesus do Monte.